Japanese Episode 013: "Masaki's Lighthouse"
American Episode 113: "Mystery At The Lighthouse"
On the way to Kuchiba City, Kasumi and Takeshi point out that Satoshi has only caught six pokemon in his quest to become a Pokemon Master. Determined to show his friends that he has what it takes, the young trainer wanders onto a beach where he encounters a Crab. The water-type pokemon is quickly captured, but as soon as it enters its Monster Ball, the Monster Ball vanishes! Satoshi starts to freak out about his pokemon's whereabouts until he's told by Takeshi and Kasumi that it was simply transported to wherever he got his Pokemon Zukan. Thinking back to Orchid-Hakase and how absent-minded he can be only increases Satoshi's worries, so he desperately searches for a phone so he can check up on his pokemon's status. Eventually, our heroes come across a lighthouse owned by the famed researcher Masaki. After confirming that his pokemon is OK, Satoshi helps Masaki out of a Kabuto costume that he had gotten himself stuck in. Later, Masaki shares some information with Satoshi such as the fact that there are over 150 known species of pokemon and that he thinks it's impossible to discover all the pokemon that exist in the world. He then takes our heroes outside where he shares with them a story about a giant pokemon who's been wandering around the area. Masaki wants to meet it, so he plays a recording he had made to lure the unknown beast to his lighthouse. The plan works, but the mysterious pokemon is driven away by the Rocket-Dan and their bazookas. The next day, Masaki tells our heroes that he won't give up on his dream and that Satoshi shouldn't give up on his dreams, either. With a renewed sense of purpose, Satoshi and his friends continue their journey. This is one of those episodes that's kind of important but, at the same time, isn't. While it establishes a lot of key things about the franchise - the six pokemon only rule, pokemon getting transported back to Orchid-Hakase's - there are other things that are brought up but are either never mentioned again or are abandoned. Like the whole "you can trade pokemon by pressing the white button on your Pokemon Zukan" thing. 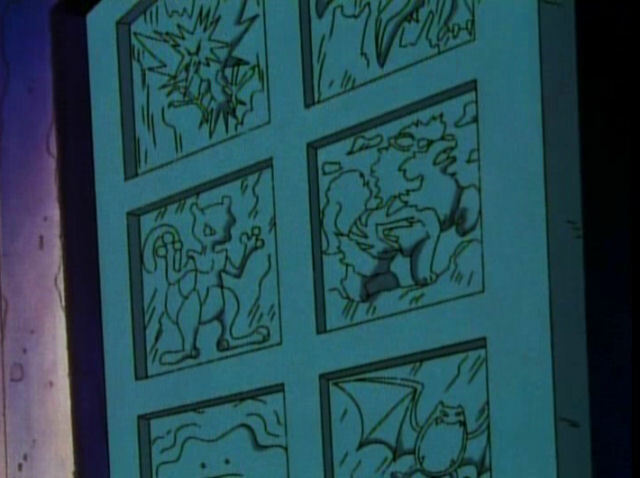 And the "people eat pokemon" thing that will come up a few more times but will ultimately disappear from the series. Or the whole "let's meet the guy who manages the storage system" thing that's only done in Kanto and nowhere else. I was also, for no real reason, amused by Satoshi attacking Crab with a stick. No idea why; maybe because it's just a ridiculous image? One thing I do want to be sure to point out is how the voice actor for Masaki, Onosaka Masaya, has done a lot of famous voices throughout the years. The idea that the lighthouse dude in Pokemon is voiced by Vash the Stampede and Don Patch, for example, is just too funny to me. I've also got to mention the fact that Masaki has an image of Myuutwo on his door when, as of this episode, the Rocket-Dan were the only people in the world who were supposed to know of its existence. What gives, Masaki? Do you secretly work for Sakaki or something? Both Crab and the Mystery Pokemon (who looks a lot like a Kairyuu) retain their Japanese voices. Ash: "...and I caught 'em all, fair and square!" Misty: "Caught them!? Ash, all your Pokémon followed you!" Aside from being an incorrect statement (Charmander and Squirtle are the only ones who really followed him), Misty's line is a pretty lousy translation of what was said in the Japanese version. Originally, she asks if he can really say that he really "got" all his pokemon. Satoshi responds by saying that "getting" and "coming with" are close enough. Kasumi doesn't say anything about his pokemon following him. Bill: "That's great. Can you cook without using tofu?" Brock: "Oh sure, I can cook lots of things without using any tofu." Bill: "That's good. I've been eating nothing but tofu since my cook went on vacation. Come on in." Originally, Takeshi’s asking the same question (if he can use Masaki’s kitchen), but instead of Western-style food he tells Masaki that he makes delicious tamago chaahan and nabe. Masaki replies by asking if he can make yakisoba as well, and Takeshi responds that he can make that in addition to katayaki, chow mein, sauce yakisoba, or anything else Masaki might want. (Way to pat yourself on the shoulder, Takeshi). Anyway, Masaki concludes by saying that he'd really like to have some katayaki (none of this "I apparently have a cook and he or she is on vacation now" stuff) and invites everyone in. Later, when Ash uses the Bellsprout-shaped phone (something that Kasumi brought up but Misty didn't, by the way), he says he's going to call Professor Oak collect. In the Japanese version, however, he just mumbles to himself about remembering Orchid-Hakase's phone number. Oak: "Well hi Ash! You caught me cooking dinner! My cook is on vacation, and I've got to fend for myself 'til she returns." Just like before, there is no mention of any cook in the Japanese version. Originally, Orchid-Hakase just tells Satoshi that he's in the middle of making some nabe. The dub also makes it sound like both Bill and Professor Oak don't really care for tofu when the opposite seems to be true in the Japanese version. Bill: "Thanks for helping me get out. I've been stuck in that costume for hours." In the Japanese version, Masaki merely introduces himself as Masaki the researcher. He doesn't mention how long he's been stuck in the costume. There's a music-related note I wanted to point out about this episode; during the part where Bill explains about how he wants to study extinct pokemon, there's no background music being played at all. We get a full 32 seconds of silence, something that we almost never get in a dub that insists on being wall-to-wall music all day everyday. The ironic part is that in the Japanese version, there is music being played. So essentially, 4Kids did the opposite of what they usually do by removing music, not adding it.